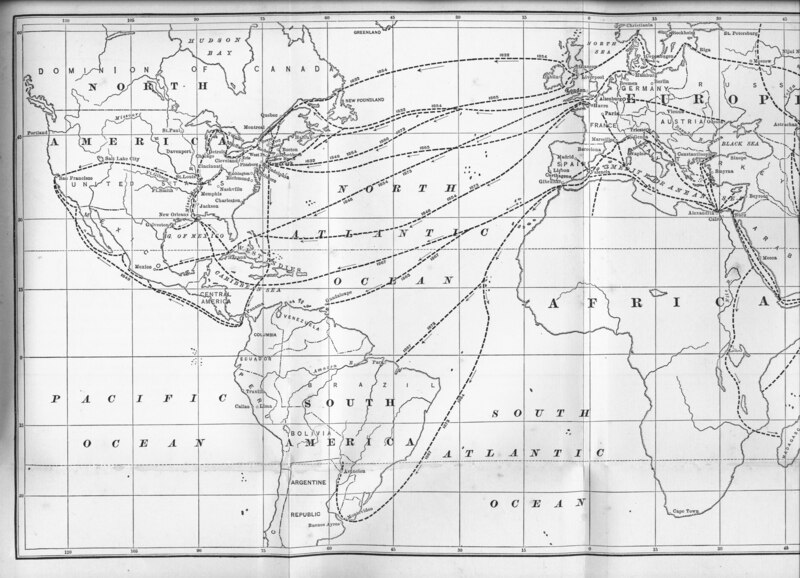 The disease migration route along common commercial routes is one of the earliest and most commonly produced disease maps during the 19th century. A number of point (case) maps are seen during the earliest years, but these quickly became outnumbered by the maps produced defining regions of cholera and the transportation routes connecting these regions. There are two behavioral patterns expressed in these maps of cholera, the reasons for which are alluded to at times by a review of the cholera articles published between 1817 and 1845–the period after the first global epidemic to begin by striking Europe, leading up to the year just prior to the initiation of the second global epidemic. A review of the biography of Cholera as it appears in the Index-Catalogue of the Surgeon General provides considerable insight into the two arguments out there about the cause of cholera and the varying reasons for its changes in diffusion behaviors. Several common themes were out there about cholera and the environment. The two common themes as to its cause and effect relationship with people stated that cholera was spread as an infectious disease that could be passed on to other individual directly and indirectly, and the second theory which stated that cholera erupted in some areas due to the nature of the area and its people. 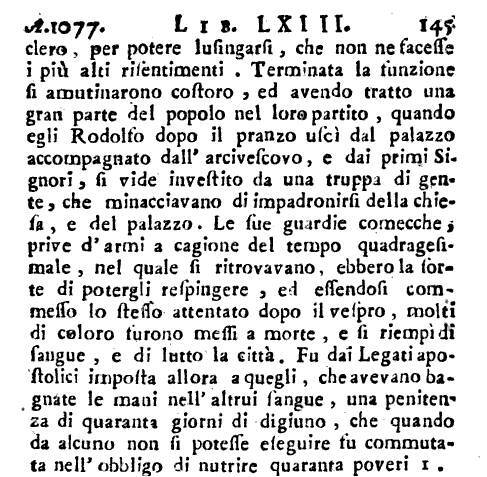 This second theory claimed that cholera erupted as a result of human behavior related to the immediately surrounding environment, and typically blamed the disease on a miasm or miasm-equivalent produced by nature, something related to and/or causing poor sanitation and hygiene, or poor decaying environmental states in proximity to the cholera nidus. Medicine and science underwent a major change during the 1980s when the bacterial theory for disease came to be. In spite of blaming the disease on this new cause, there were some traditionalists out there who refused to accept this theory. The initiation of their theory was in part due to the alternative health care physicians and their followers, who during the mid and late 1880s refused to accept the proof being generated about the bacterial cause for disease. This refusal to accept the bacterial theory was further supported by the homeopathic physicians and their numerous claims to fame as successful healers of individuals with cholera. In general, it was possible that this success was due mostly to the ongoing support of the use of the lancet that regular physicians had. Reviewing the Surgeon General’s Index Catalogue bibliography, the single most common treatment for cholera aside from homeopathy with numerous articles written about it was the use of water and other fluids to replenish the body of the precious water lost due to the type of diarrhea that vibrio produced as part of its chief cause for illness and death. 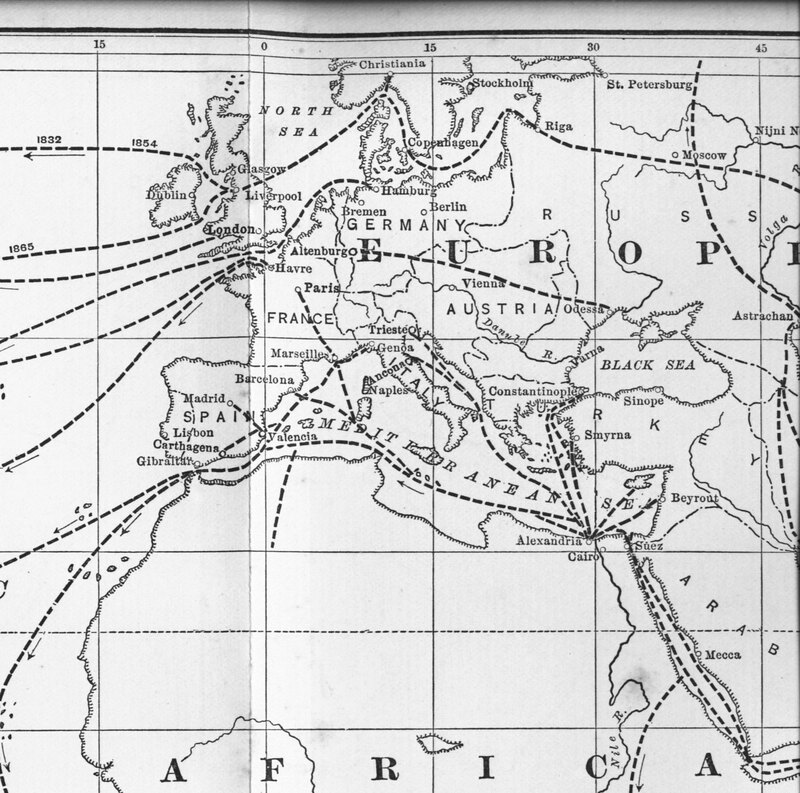 The above figure compares with Scouttetten’s map depicting cholera diffusion in 1831 in Eurasia, in that a series of migration routes are defined which are due to transportation behaviors. This linear pattern is dominant throughout the first three epidemic periods of diffusion into the United States for the years 1832, 1848/8 and 1854. Once the disease is “planted” in an urban setting (hierarchically, or from the densest small areas to the least populated urban areas, or reversed hierarchically, meaning that the poorer communities are stricken first before rich communities become ill), it can then begin to behave more in a two-dimensional x-y axes behavioral pattern and through mapping appear as though it is being spread in many directions or in every possible direction, radiating out from the niduses. The two maps above demonstrate mostly the linear transportation routes. Each has a single outlier. The US map shows a pattern of spread across a great distance along the California Gold Rush trail from the Great Plains across the Rocky Mountains. This trail is obviously not following any permanent population feature, and demonstrates how people alone can bring an epidemic pattern along with them as they travel. In this case, the limiting factors preventing possible spread along such routes would be climate and temperature patterns along the route, since vibrio requires a certain warm temperature range to persist outside the human gastrointestinal environment during periods in which human infection and contact do not exist, and it requires a certain ecological setting to reside in between victims–namely an alkaline water source with adequate growing surfaces (clay particulates in the mud for example), a soil-geology define ecological feature found on Platte River near Fort Kearney, and in certain parts of western Nebraska and eastern Wyoming. Stille’s map can be compared with several others, historical and recent, to get a better understanding of the cholera diffusion history. There are two results of this comparison that stand out. The ability of cholera to migrate across a broad area with little interaction with environment suggested to any physician in the early 19th century that the disease was either directly involved with some transmission process involving people and their bodies, or was a result of the items people owned and wore, and produced either in the form of perspiration, exhalations, human waste, or some other “miasm” being emitted by the body of an infected individual. 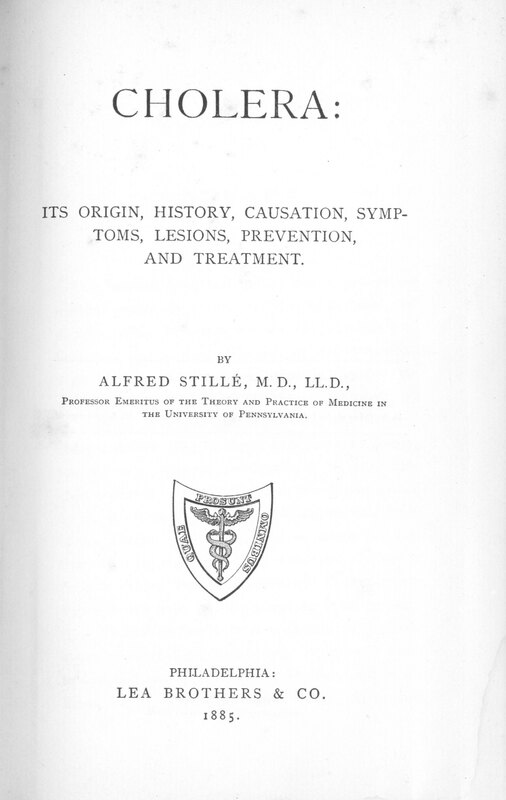 In the 1820s and early 1830s, the period when Scouttetten developed his philosophy about this disease, this meant that there were several forms of “miasm” in need of better review–meaning that miasm wasn’t just this simple theoretical substance that had to be produced in order to explain disease transmission, that it had to be a little more detailed in order to make all the possible variations in this theme fit the observations being reported. Such was the reason the koino-miasmatic theory developed for cholera during the early 1800s, but made popular and credible by 1827. Quarantine practices by this period of time in medical history had become standardized. 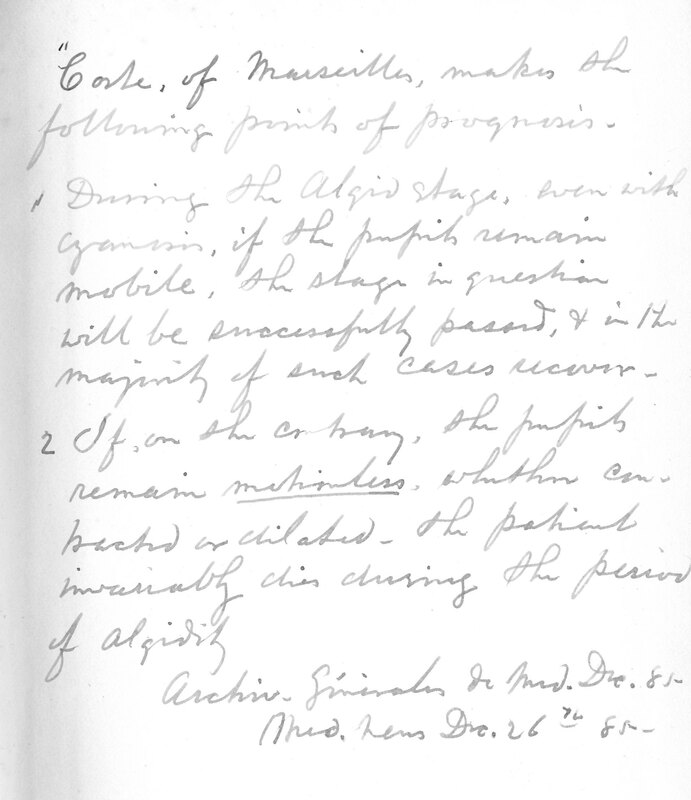 The note in Stille’s book links the biology and morphology of the vibrio, now known to be the cause for cholera, to how the Code of Marseilles needs to be followed during periods of possible disease transmission. International Flag for Quarantine of Ships. There were two colors used for Quarantine in the 1700s and probably the early 1800s. 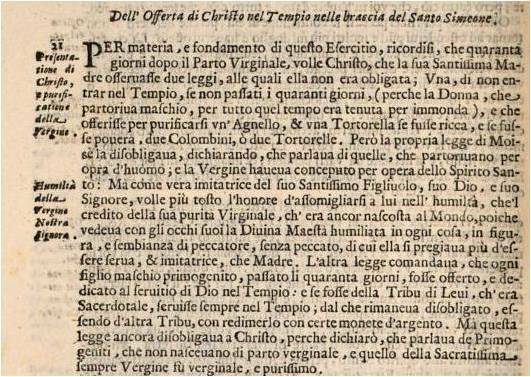 White was used since 1720 [Henningen, referring to the Plague of Sweden (1710-13) writes: “Danish sources give information according to which, during the great plague of 1710-1711, ships placed in quarantine should hoist a white flag.”] This was noted for 1751-Capetown, 1799-China, and 1846-Hawaii. Yellow, used as early as the 14th century, became the standard in Britain on 1 January 1789; this use became more international ,at least along British commercial routes, some time between 1799 and 1805. The above map and close-ups depicting the cholera diffusion are by Scouttetten. 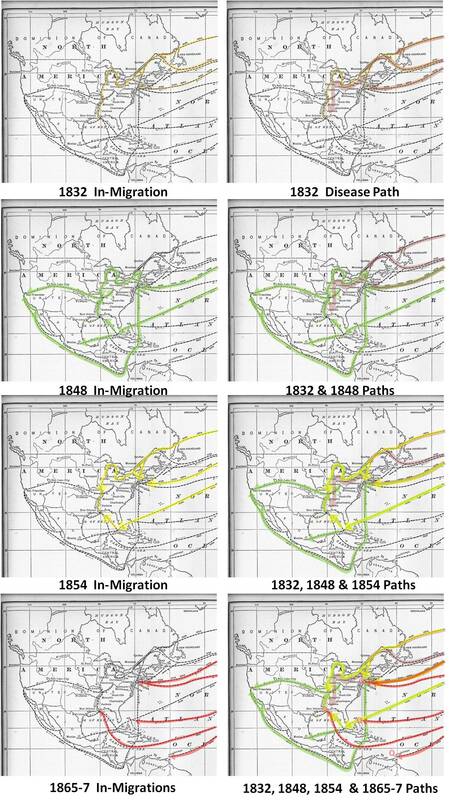 They portrays the 1831 epidemic diffusion pattern in Europe and Asia and demonstrates the same human-migration dependent pattern seen for the California Overland Trail used during the 1849 Gold Rush and subsequent migrations. The people and the disease traverse a fairly extensive mountain range (the Urals versus Rockies), due primarily to human transportation behaviors, not natural ecological or pedologic features. Speed of travel is important. For Scouttetten’s map, transportation speed prevails and effectively spread cholera due to military travelling activities–historically the armed forces are capable of travelling much faster than non-military groups. It is also possible that certain portions of this route along the path from Orenburg to Cabul may bear a soil-geology history that mimics the same for North America along the Platte River (Afghan geological features have a history of being very alkaline due to limestone richness), but this part of this cholera diffusion story hasn’t yet been investigated. Suffice it to say Scouttetten’s map depicts a human diffusion process extending the migration of cholera beyond the primary transportation geography feature of normal renderings of this diffusion. Also notice that this method of diffusion mimics the North American California Route, and not the Oregon Route (population density patterns for the Northwest and weather and climate features of the trail from Nebraska to Portland, Oregon are different–see my thesis on this). The following maps on diffusion illustrate this change in diffusion behaviors, a finding popularized by Geographer Gerald F. Pyle. When we relate the above maps to the cholera maps produced later by Pyle (the following figures are taken from my thesis), we can see there is a repeat of the first two patterns of disease diffusion in Eurasia (the 1817 inferred by Scouttetten and the 1831 that Scouttetten mapped), defined by Pyle for his description of the United States cholera migration maps. These maps used by Pyle to depict these differences in diffusion patterns are in turn based on a much lengthier, but non-interpretative series of maps published in 1875 by John C. Peters (detailed separately). In conclusion, we can relate these maps to each other. Scoutetten’s map of 1831 represents the second period in Cholera pandemic activity for Europe and Asia, the first pandemic taking place in 1817. It was during this second pandemic experience in Eurasia that the cholera demonstrate that isolated example of being able to depend solely upon human population to survive during its trek across an otherwise impassable physical geography setting for vibrio diffusion to occur. In North America, 1832 forms the first pandemic period to strike, followed by the second pandemic period of 1849. These two stages of diffusion are defined by Pyle as Type I and Type II. According to Pyle, the first pandemic of each would behave according to his “Pioneer diffusion patterns” model, and the second according to his “Mixed” model demonstrating a much clearer hierarchical behavior (Pyle does not mention the reversed hierarchical mode, in which the primary hierarchical diffusion from one highly populated area to the next does happen, but has its actual niduses or starting points defined by socioeconomic status, with the poor living in outlier regions rather than in the more expensive urban center). We can relate Pyle’s map to a portion of the 1885 map produced by Stille. The following figures depict the individual epidemic periods displayed individually and overlapped chronologically. 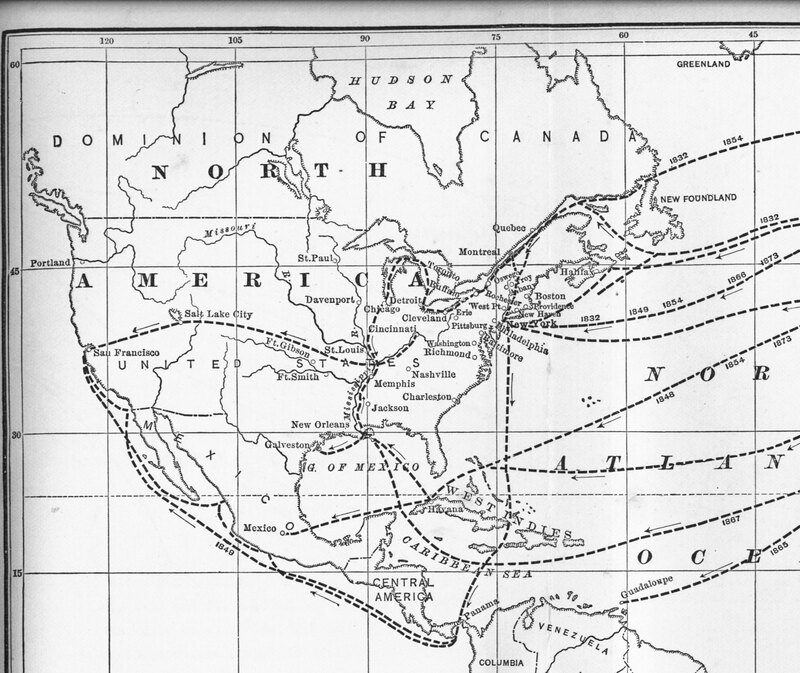 The In-migration maps depict the manner in which the disease entered the United States. The Disease Path maps provide a generalized model of the diffusion process, focusing on linear paths following the ocean, bay, lake and riverway transportation routes. Each of the epidemic periods followed a different route due to differences in local and American history. Some of these changes are responsible for the different diffusion routes taken. Others follow the diffusion concept, especially the first two epidemic periods of 1832 and 1848. The reduction in diffusion and means for disease introduction for the 1854 and 1865-7 epidemic periods has a mixture of historical events preventing the diffusion process. For the 1854 in-migration, important lessons were learned about the nature of cholera, its ecological features, its climate-, topography and even geographic (latitude) limitations. This enabled some prevention of diffusion processes to begin to take shape, in particular events related to sanitation, water sources and cleanliness, hygienic lifestyle practices, and person-to-person disease patterns, the result of a better understanding of the contamination and infectious disease transmission events and requirements. By 1865, many of these sanitation practices were well understood and now in place, in particular related to the in-migration of cholera cases. The diseases may have been able to follow the diffusion processes taken years before, but due to human interventions were prevented from migrating too far inland and impacting too many individuals. Population density features were by this time more defined in previously unsettled regions, enabling them to be infected along transportation paths followed by the cholera in 1854 and 1848. But for the most part, there were improvements made in how to reduce the diffusion of cholera from this period on in 19th century American medical history. Evidence for this success is seen with the general behavior of the 1873 epidemic, which was mapped very well by John Peters and colleagues. The 1873 epidemic manage to strike many of the same urban settings as prior epidemics, but this time these localized epidemics were monitored more completely and effectively using disease mapping. Therefore, the 1873 epidemic that managed to make its way primarily through non-policed routes could be detected and monitored. Everything about the behavior of cholera in various population density and natural ecological settings was now better understood, enabling the discovery of its cause to ultimately result in rapid development of highly effective disease prevention programs. Stille’s book was written and the map produced just as this was becoming fully understood about the epidemiological behavior of cholera.